At the Tahrir Institute for Middle East Policy (TIMEP), we strive to produce rigorous research, data-driven analysis, and policy tools that advance more effective policies toward the Middle East and Africa. To this end, we have created a product that offers succinct, policy-relevant information on regional issues, laws, and policies, highlighting the context in which developments occur, their trajectories, and implications. These TIMEP Briefs are published and updated regularly, incorporating relevant developments as they happen. • Law briefs provide insights into legislation produced by regional governments, with descriptions of the laws, analysis on their adherence to national and international legal norms and obligations, and information tracking their implementation. Briefs on Egyptian law have covered the Protest Law, NGO Law, Counter-terrorism Law, a media regulation law, Cybercrime Law, and a military immunity law; and briefs on Syria have covered the military service amnesty decree, Law No. 10 on housing and property, and the Counter-terrorism Law. • Issue briefs track and analyze ongoing, policy-relevant issues as they unfold, highlighting trends and implications on the ground. For Egypt, these briefs have covered Christian issues, sectarian violence, the Sinai tribes’ involvement in the war on terror, and the right to housing, as well as the Grand Ethiopian Renaissance Dam and Syria’s Idlib province. • Policy briefs cover the policies and actions toward the region from the United States, Europe, and other relevant actors, offering greater clarity into the processes by which these policies are created and the anticipated impact on the countries toward which they are geared. 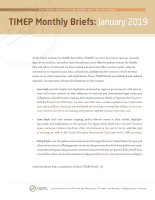 Policy briefs have covered the release of security assistance to Egypt and fiscal year 2019 appropriations to Egypt.